MP Filtri has launched its new DEH series of ATEX clogging indicators. Lighting specialist Glamox has extended its TX60 LED range of explosion-protected (Ex e) LED light fittings for Zone 1 hazardous areas with a through-wired emergency battery-operated version that is fast and easy to install. TX60 LED light fittings are specifically designed to enable rapid, easy replacement of existing T8 fluorescent light fittings without requiring any additional design or installation changes. BLIDAR a collaborative research initiative has utilised the Port of Tyne in the latest stage of its offshore wind project. One of the UK’s leading product manufacturer and global supplier of fire, blast and heat hazard solutions - Mech-Tool Engineering Ltd (MTE) - has announced it has successfully secured its second contract to fabricate 20 internal support structures to what will be the world’s largest wind farm to date. North East fabrication and engineering powerhouse – Francis Brown – says it is making its mark in the global offshore wind sector following a series of prestigious contract wins. SKF Wind says it will be showcasing a wide range of solutions, as well as demonstrating its uniquely informative content hub for the wind power industry, at this year's WindEurope exhibition and conference, which takes place during November in Amsterdam. New monitoring technology developed by RED Engineering has reportedly been used for the first time to improve accuracy, speed and safety during the installation of jacket foundations for wind turbines at the Beatrice Offshore Wind Farm Ltd project in the Moray Firth, Scotland. A Teesside based product manufacturer and global supplier of fire, blast and radiant heat protection systems reports it has successfully delivered a contract for Statoil’s £1.5 billion Dudgeon Offshore Wind Farm project. The new business unit in Sweden was set up in September 2016, and Deutsche Windtechnik AB in Scandinavia reports it has been growing steadily since then. The company says the municipal utility in Varberg, Varberg Energi, commissioned the independent service provider with the maintenance of 30 wind turbines from Vestas (23x V90) and Gamesa (7x G90), with an option for 12 additional turbines. Babcock, a leading UK engineering support services company, reports it has deployed its floating LiDAR (light detection and ranging) technology to provide valuable offshore wind data to the proposed Aberdeen Offshore Wind Farm. Babcock says its innovative floating LiDAR system, ‘FORECAST’, has been installed as part of a 12 month contract to collect wind resource and metocean data, for Aberdeen Offshore Wind Farm Ltd (AOWFL). Barrier Group businesses, specialist coatings provider Barrier, and rope access company, UK Total Solutions, report they have collaborated to complete a major remedial painting and maintenance contract on the London Array wind farm. Strainstall, a leader in the development of innovative monitoring solutions and part of James Fisher and Sons , reports it has been awarded a contract to provide crucial mooring monitoring for the Hywind pilot park – the world’s first floating offshore wind farm. The company says the contract with MacGregor, a provider of innovative engineering solutions for handling marine cargoes and offshore loads, will provide an integrated offshore mooring solution for the floating turbines. The UK’s first floating wind farm will be installed at the Hywind pilot park offshore, Peterhead in Aberdeenshire, Scotland. This marks an important step forward for offshore wind technology, and potentially opens attractive new markets for renewable energy production worldwide. ODEE reports. A new Carbon Trust report, launched by Minister for Energy Fergus Ewing MSP, sets out the current state of the floating wind industry and identifies key technical barriers that need to be addressed to make it a commercial reality. Kite Power Solutions, a British clean-technology company, has embarked on a £10M funding round to support the commercial development of its kite power technology for deployment in offshore waters. Kite Power Solutions’ technology promises to be a step-change in the generation of electricity from wind compared with conventional wind turbines that use tonnes of steel. As it’s cheaper to manufacture, easier to deploy and maintain and would be free of government subsidies, this technology has the potential to transform the offshore wind market in the UK and the international markets. 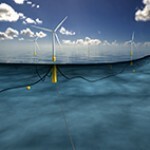 Kite Power Solutions is aiming to deploy its first 3MW power system in offshore waters by 2019. Only a few days after announcing the official start for Siemens’ wind turbine manufacturing facility in Cuxhaven, Germany, Siemens senior management and political leaders gathered in Cuxhaven for a signing ceremony for the planned facility. ABB, the power and automation technology group, has won a significant order from the Dutch-German transmission grid operator TenneT to design, engineer, supply and install an Alternating Current (AC) power transmission cable system that will connect Butendiek, an offshore wind farm in the German North Sea, to the HVDC (high voltage direct current) converter platform SylWin alpha. Dong Energy has welcomed the decision of the Secretary of State for Energy and Climate Change to grant development consent for the Walney Extension offshore wind farm, located off Walney Island in the Irish Sea. Siemens has received an order for the turnkey delivery of the grid connection for the Dudgeon offshore wind farm. The customers are the Norwegian utilities Statoil and Statkraft, which are jointly implementing the wind farm off the coast of the U.K. Siemens will supply the entire power transmission system, including the two transformer substations – one onshore and one offshore – for the 402-megawatt (MW) project. Supported by aggressive renewable targets, policy backing and a shift towards a greener climate, the UK propelled itself to the head of the global offshore wind power market in 2013, boasting a cumulative installed capacity share of around 52%, according to research and consulting firm GlobalData.